So I joined a little swap group of gals who love Gilmore Girls. I LOVE Gilmore Girls. I couldn't be more excited about the revival shows coming up. While Max wishes to move to Hogwarts, I'm a Stars Hollow girl through and through. So I joined a swap group where we all bought Crush Books (I chose Bluebird, which incidentally are on clearance on my website right now for less than $4. But I digress...). 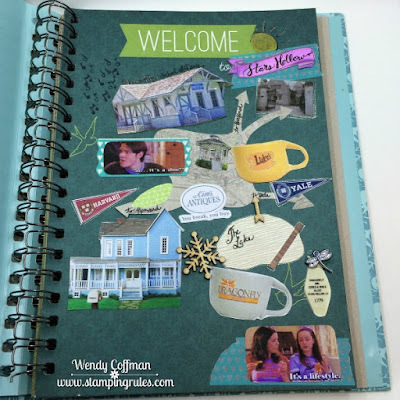 We are crafting pages in the books based on specific themes for each round of the swap, mailing our books person to person so we can create pages in each others Gilmore Girls books. 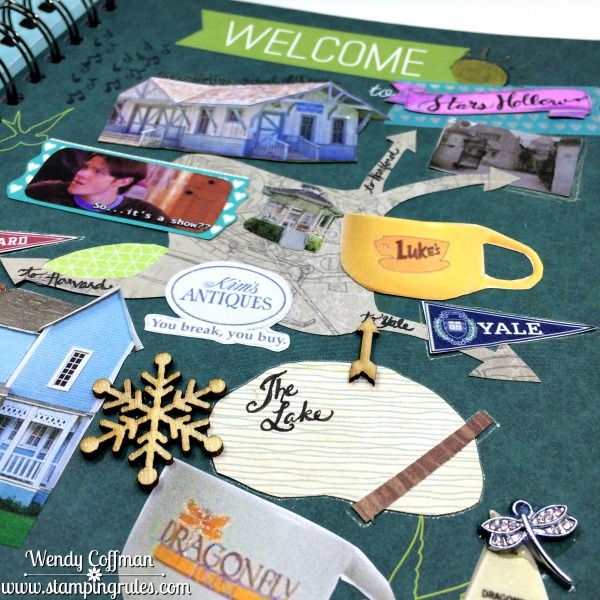 For my cover page I wanted to kind of make a map of Stars Hollow like this one, including lots of my favorite Stars Hollow places. I used scraps of old B&Ts, print-outs of pics I found on google, and lots of ephemera that's been hanging out in my stash with no purpose. I made sure to include the bridge, which is central to one of my favorite Luke scenes, Kim's Antiques, and, of course, a big coffee cup for Luke's Diner. I left a space at the bottom to add some journaling when my book makes it back around to me, full of scrappy goodness from my fellow GG loving friends. I don't feel completely done with this page yet, but I had to mail it off on schedule so I had to stop. I can admit that this book is a project that I totally do not need to add to my busy, busy life, and yet it makes me so very happy when I'm working on it. 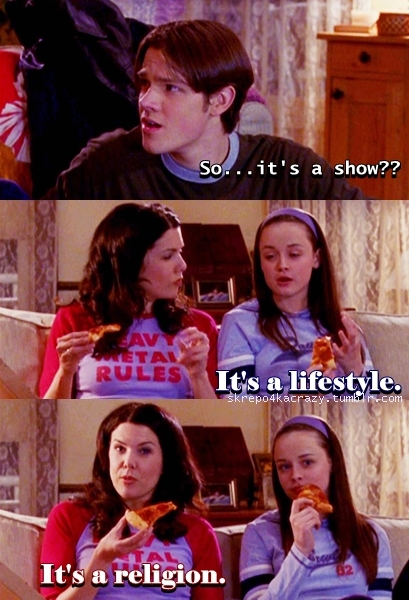 Unpacking, unschmacking, it's Gilmore Girls. Copper boom! 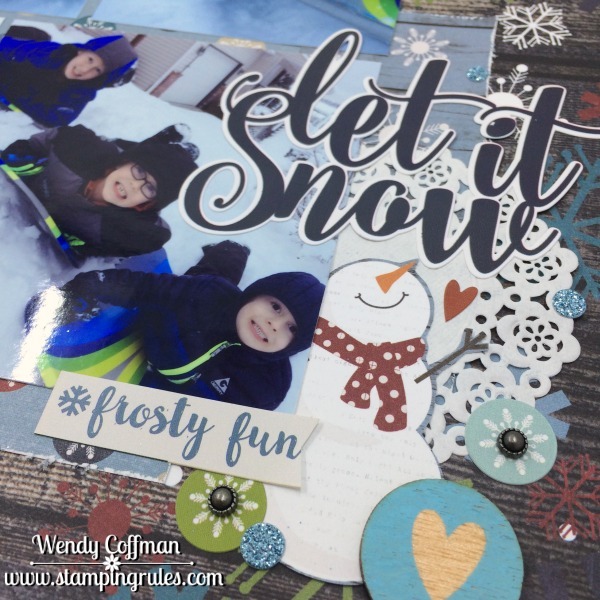 Happy Friday, Stampin' Friends! 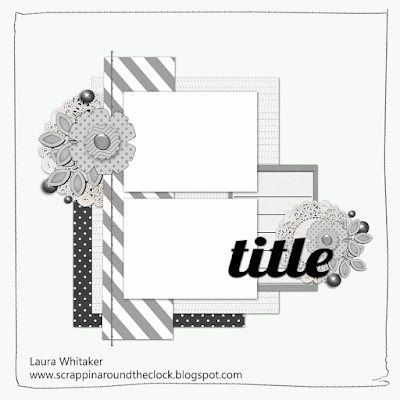 Today is the release of another fabulous sketch over at Scrap Much?! 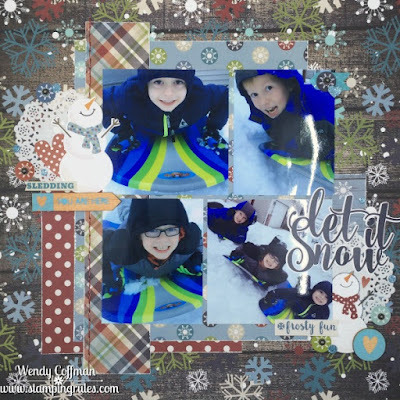 I have been hoarding this Simple Stories Snow Patrol line until I could get these particular pictures of my boys printed. I tried and tried to take good sledding pics of them, but everything was blurry or (of course) they weren't looking at me. Then I got clever, and had them each pose by flinging themselves onto the huge snowdrift next to the front porch where we piled all the snow as we shoveled the driveway. Ready? Action! Eye contact!! I trimmed another size of the adorable snowman out of one of the pocket scrapbooking cards included in my Snow Patrol pack. I wish he were a stamp! I actually had trimmed up another card to add a title when I realized I'd overlooked this beautiful scripty sticker title on the coordinating sticker sheet. Don't you just love this sketch? 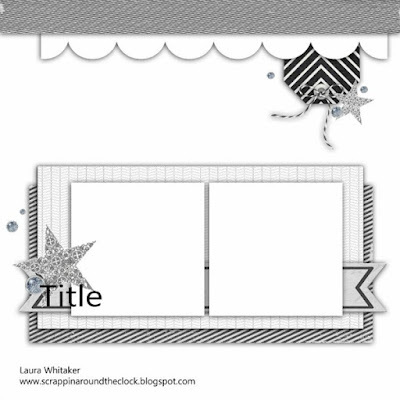 If it inspires you too, make a page and hop over to Scrap Much? to link up your creation! So it's not technically my week on the DT for Scrap Much?, but this week's sketch was such a cutie I had to make a layout. 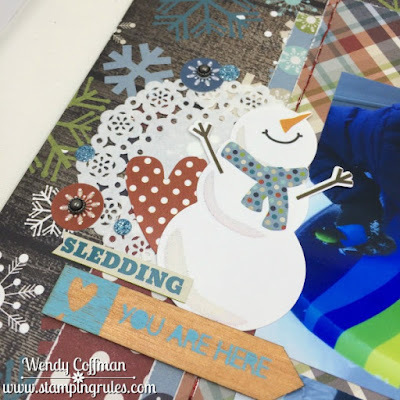 I got to play with some really cute papers from the Adorn It Family Path Collection. 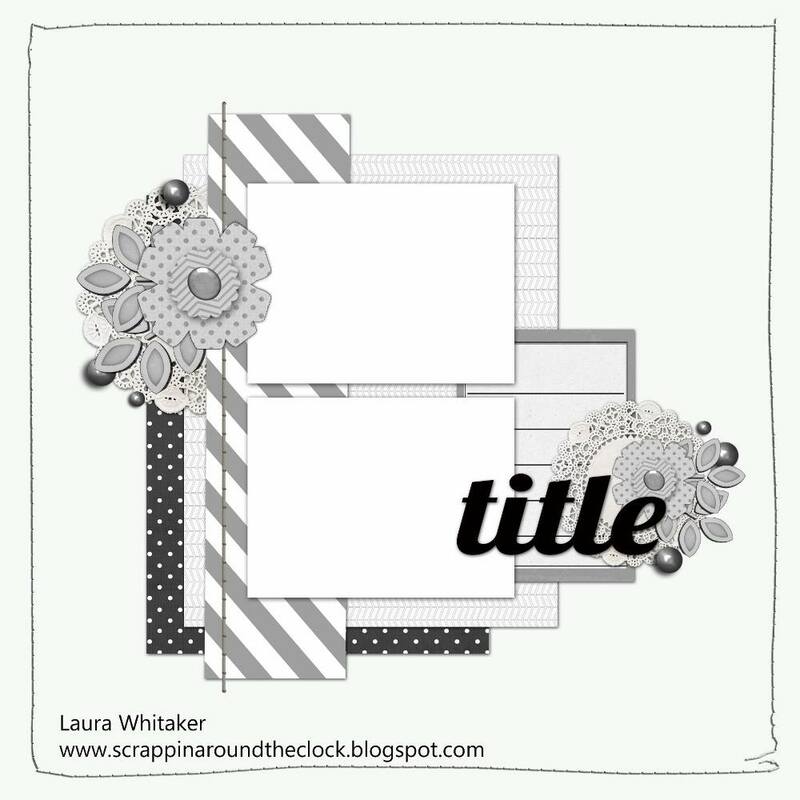 I really love this whitewashed wood background and the colors combined with the bold black and white stripe. I did a lot of torn edges throughout the layout and scissor distressing on all the more solid elements. Before adding my pics I added some watercolor splatter in pink and black. I only had a couple of pics from this sweet family visit from last summer, and I've been wanting to scrap them for a while. Here's the sketch - isn't it fab?! 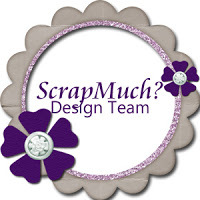 You can join in the scrapping fun over at Scrap Much?. 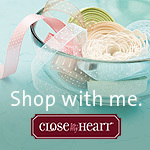 Tonight I'm packing instead of unpacking... for the CTMH Seasonal Expressions launch in Seattle this weekend! I'm so excited to get to hang with my CTMH peeps, checking out the new goodies, laughing, and learning! 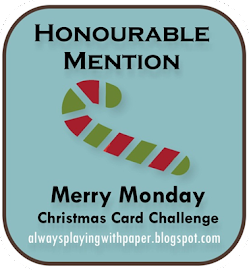 It's an afternoon event, so I'll be attending a team meeting in the morning and this is my card for the swap. I wasn't quite done playing with the watercolors and salt technique. I painted some large pieces of paper first with a lot of water, then blue and green watercolors. You want the paper to be fairly wet. Then I sprinkled on some really big salt flakes I had in my kitchen, which led to bigger splotches in the watercolor as it dried. I really liked the bigger salt flakes. My inspiration sketch came form RetroSketches. I stamped the pirate from Pirate Birthday, then took him (and all his buddies) along to the park with the boys to enjoy the sunshine while I colored and cut them out. I added the ARRRR! with Block Uppercase, and that's also where I got the "x"s to mark my spots on the card border. 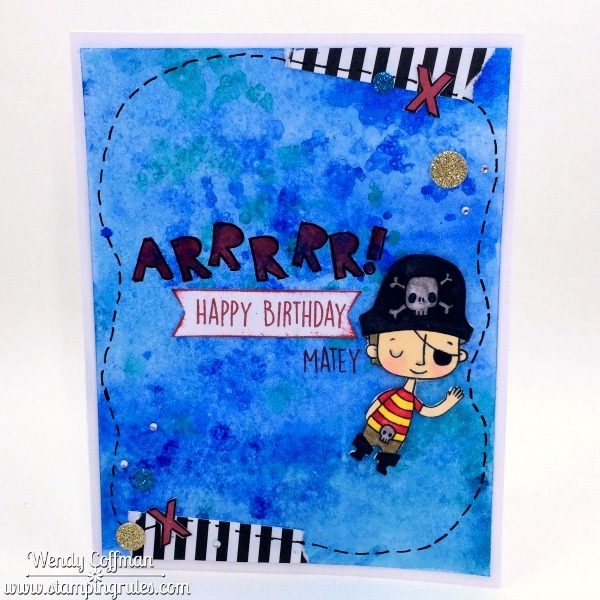 The pirate stripe B&T is actually from the super girlie La Vie En Rose papers. Finally I added a bunch of glitter dots and jewels for the pirate booty. ARRRRR!! 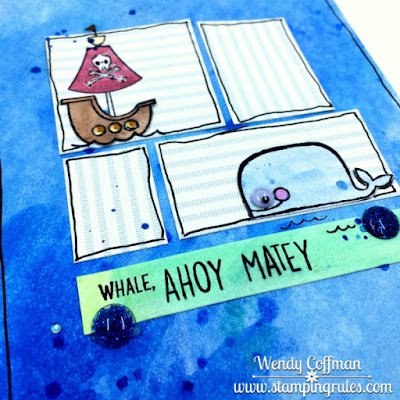 I had a practice panel of the watercolor salt wash technique I used on my Watercolor Blog Hop project yesterday, so naturally I had to use it for the 150th sketch over at Atlantic Hearts Sketch Challenge. 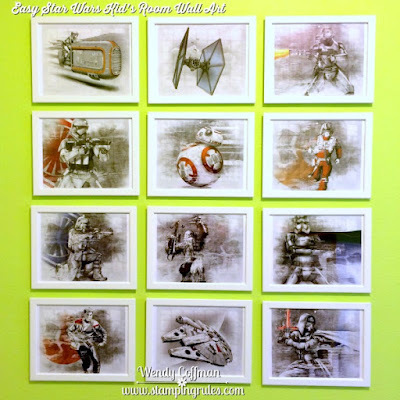 The background was done with lots of water and watercolor paints sprinkled with salt and left to dry. I trimmed the panel to size and added some bits of Penelope paper. I painted some scrap cardstock with red and blue paint and let it dry. 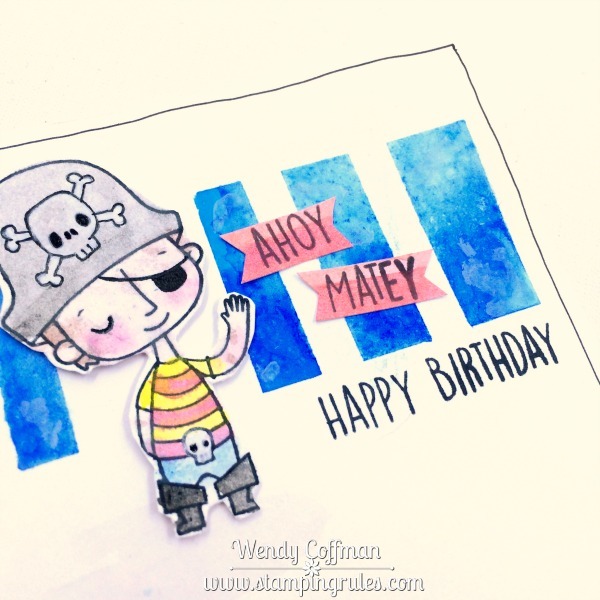 Then I stamped images from Pirate Birthday and Animal Greetings (which is the Operation Smile benefit stamp set) onto the painted paper to fussy cut and add to the card. I added a 1/2" strip of green watercolored paper for the bottom banner. I stamped on a combo sentiment. 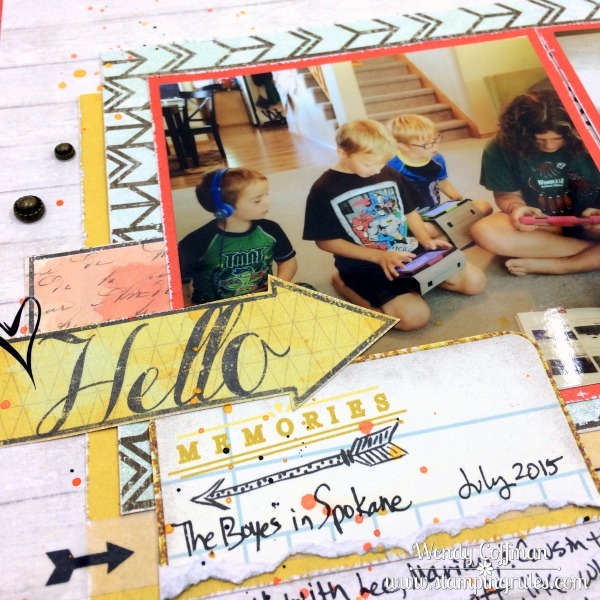 All my stamping was in Memento Tuxedo Black ink. I added a wiggly eye to my whale friend, and some white gel pen highlights to the pirate ship. A scattering of blue glitter gems and Bitty Sparkles made blue with an alcohol marker finished off my card. 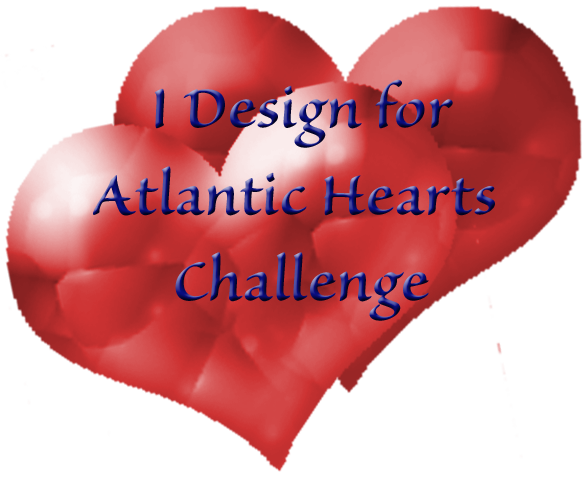 We'd love to see your take on the 150th sketch over at Atlantic Hearts Sketch Challenge! 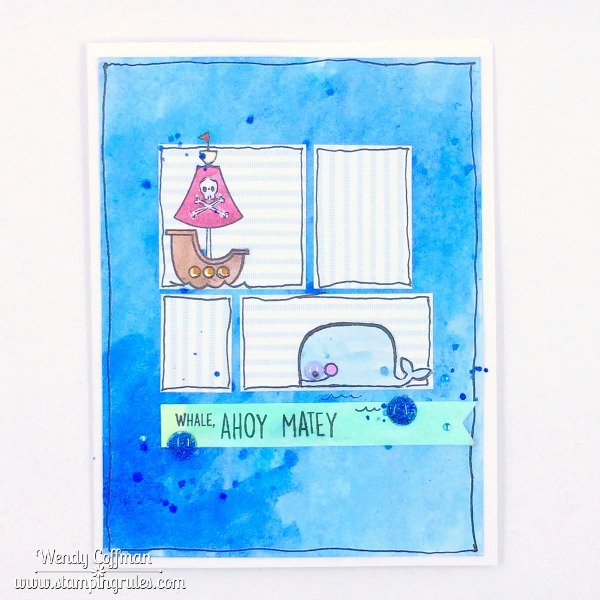 Welcome to the Watercolor Blog Hop! This month we have 30 fabulous creations using our vibrant watercolor palette to share. 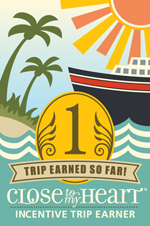 You may be arriving here from LELA'S BLOG. Let's hop! I painted a bunch of panels and flowers for my original hop project idea, but I really wanted to do something with watercolors I hadn't done before. I popped over to RetroSketches, and at first I thought that this week's cute sketch didn't really lend itself to watercolors, but I just kept coming back to it. Finally I decided to go for it. 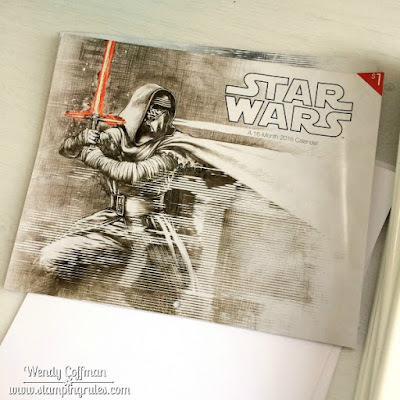 I masked off the design using fat and skinny washi tape. I masked all around the edge with washi too, just to be safe. 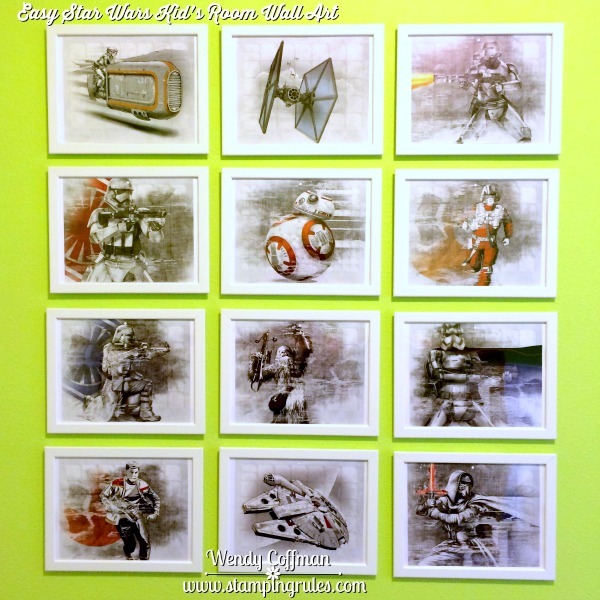 Then I did a wash of teal and dark blue watercolors int he masked areas with a lot of water. Before the paint dried I sprinkled on some sea salt, which is a really pretty effect with watercolors. When I removed the washi mask, I had these lovely bars of watercolor goodness. 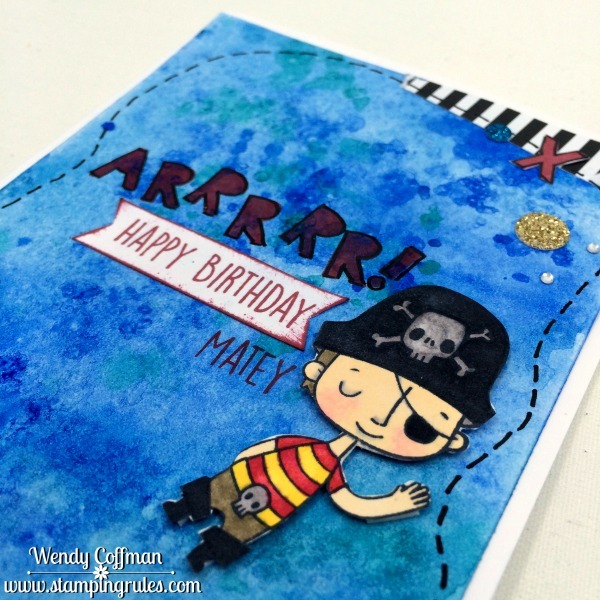 I stamped the little pirate in Memento Tuxedo black and used my waterbrush with the paints to lightly color in the pirate. I added some dirty smudges to his sweet pink cheeked face, because in my house pirates are a dirty lot indeed. I painted a wash of red onto some scrap cardstock and when it dried I stamped on the AHOY MATEY sentiments to make the little sentiment red banners. Finally I added a journaling pen line around the edge of the card. 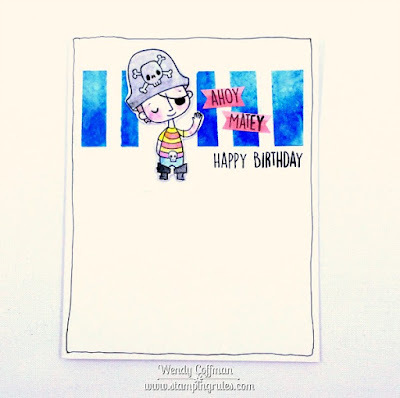 I'm linking up to the Anything Goes Challenge at Seize The Birthday. Next up on the hop is MELINDA'S BLOG. Happy hopping! 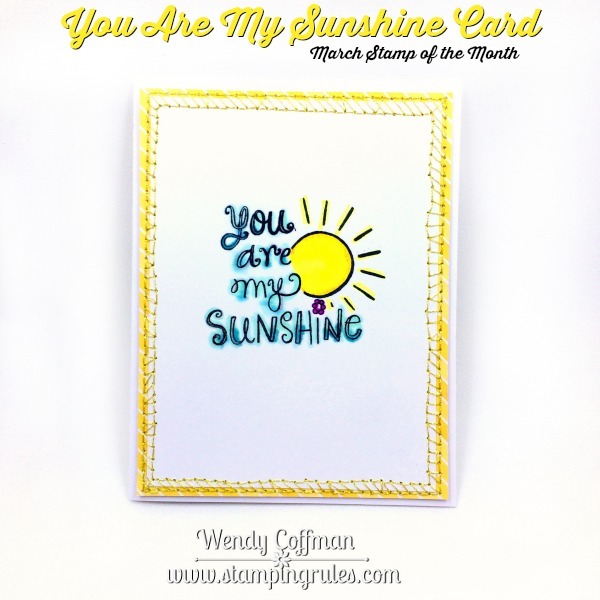 Welcome to the March Stamp of the Month Blog Hop! This month we have almost 40 talented consultants sharing their new creations with this month's adorable SOTM, Sunshine Birdies. 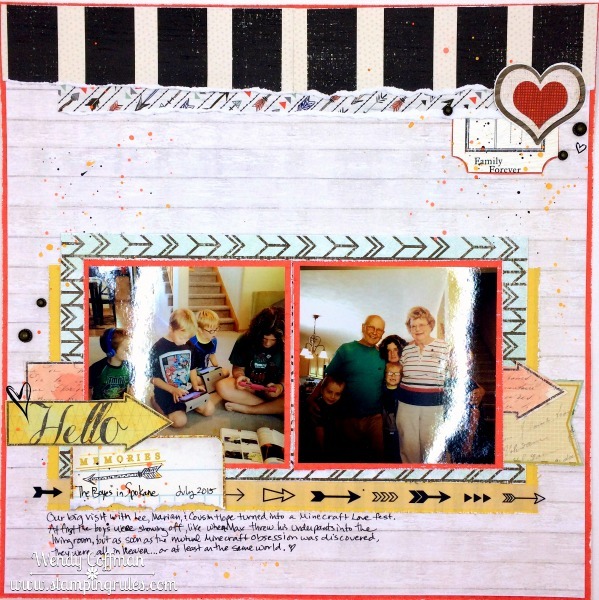 You may be arriving here from KATHY'S BLOG. Let's hop! 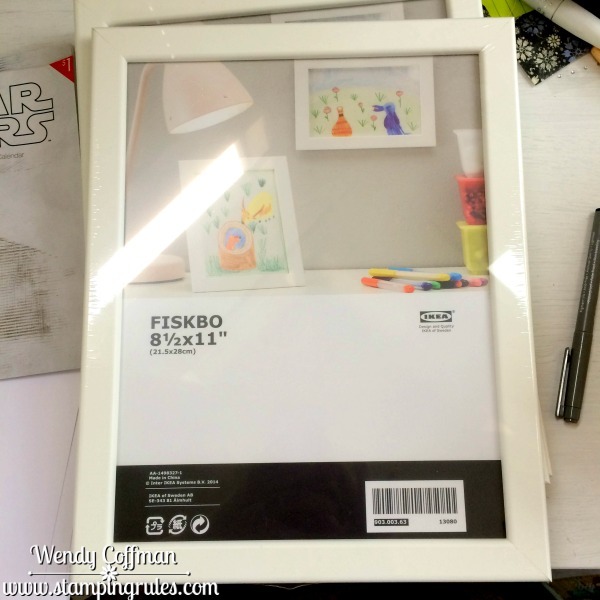 I've been buried deep in unpacking, so I knew that I didn't have time to get super fancy with this month's project. Luckily, these stamps are so cute! I especially love the fonting on the sentiments. 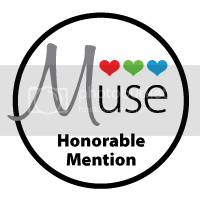 I simple stamped my sentiment in Memento Tuxedo Black ink. Then I masked off the edge and added the sunshine image. I purposely colored over my letters with an alcohol marker and then used the blender to spread the color out of the lines. 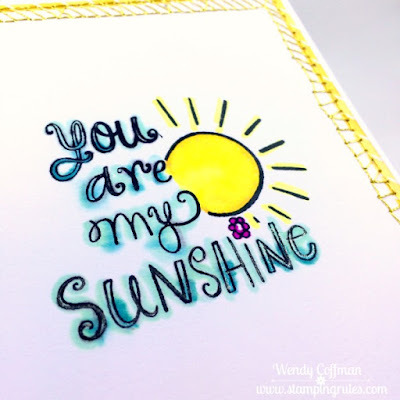 I added a few touches of shimmer gel pen (and a whole lot of gold stitch detail on the edge) to finish off this clean and cheerful card. My design inspiration came from the new sketch over at CAS(E) This Sketch. 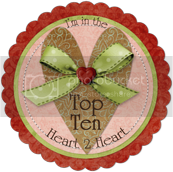 Next up on the hop is JENNIFER'S BLOG. 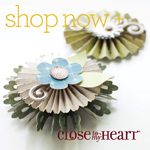 Chat with your consultant or CLICK HERE to bring these Sunshine Birds into your home today! Happy hopping!